Background: The aim of this study was to recognize the findings of ultrasonography (US) in remitted rheumatic arthritis (RA) patients for detection subclinical arthritis. Materials and Methods: This descriptive study was conducted during 2016 in a rheumatology center. A total of 70 patients with remitted RA were included in the study. Sonography was performed on all 70 patients who did not show any clinical arthritis in clinical examination to find synovitis and effusion were evaluated with gray scale and hyperemia with power Doppler US. Results: Nearly 44.3% (n = 31) of our patients had positive sonography results including 20% synovitis, 21.4% hyperemia, and 18.6% (n = 13) effusion. 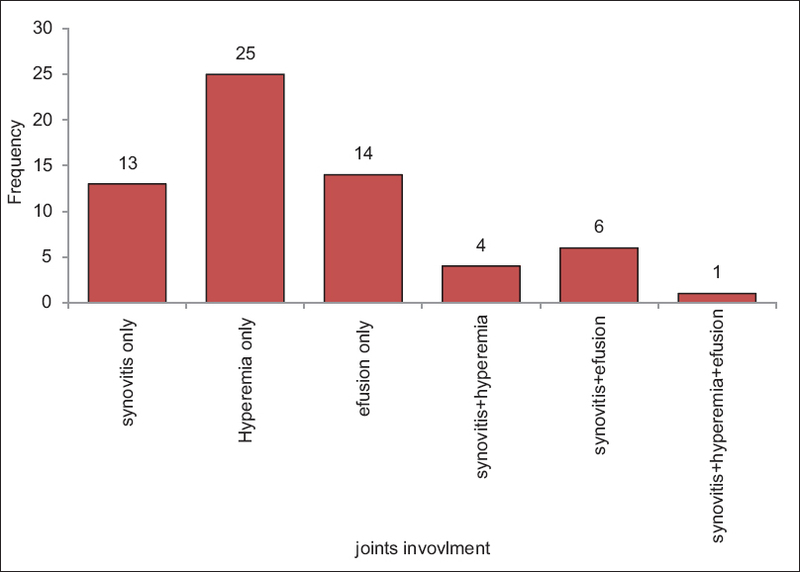 A total of 1960 joints of 70 patients were evaluated, in which 3.2% (n = 63) of joints had positive sonography findings including 1.2% synovitis, 1.5% hyperemia, and 1.1 with effusion. Conclusion: US can diagnosis subclinical arthritis in patients with remitted RA who does not show any joint involvement in clinical examination. Rheumatoid arthritis (RA) is defined as a systemic inflammatory condition or chronic progressive disease in small joint, specifically, in metacarpophalangeal (MCPs), proximal interphalangeals (PIPs), wrists, feet, and ankles causing inflammation in the joints led to deformity and limitation of joint motion. Sometimes, RA deformity leads to patient disability. The prevalence of RA is reported around 1% globally; while it was found about 0.33% in Iran, which shows a lower prevalence. RA divided into two different phases including flare and remission phases. Remission is the main therapeutic goal among RA patients. Remission phase is defined based on the history of patients, clinical examination, and laboratory data. The main criteria that shown patients in remission phase are considered according to the American College of Rheumatology (ACR)/European League against Rheumatism (EULAR). Therefore, those patients are in remission phase that to be negative in clinical arthritis, erythrocyte sedimentation rate (ESR), C-reactive protein (CRP), and DAS-28 < 2.6., Remission only way to prevent structural and articular damage, which active RA is the main cause of disability and progressive joint damage. US can easily diagnose synovitis, a pathological hallmark of RA, at the vascular and structural status. Two US methods are being employed to evaluate synovitis including B-mode or gray scale (GS) US (imaging of anatomic structures, which empowers to visualize synovial hypertrophy and/or effusion) and power Doppler PD US (blood flow detection, which enables visualization blood vessels movement, hence, identifying increased micro vascular blood flow which seen in subclinical synovitis)., Currently, musculoskeletal US (No synovitis and hyperemia in imaging) and normal clinical examination have been accepted as complete remission for monitoring of RA. The main purpose of identification the patients with remission phase is step-down treatment strategy. However, if there is still active inflammation through US and remission phase by clinical examination, Therefore, RA should not be step-down treatment. The aims of this study were to recognize the findings of US in remitted RA patients for detection subclinical arthritis; joint inflammation which identified by imaging and sonography not by clinical examination. The present study was a descriptive study which was conducted between July 2015 and July 2016 in Rheumatology outpatient Clinic of Al-Zahra Hospital in Isfahan, Iran. Patients with diagnosis of RA in remission phase (based on the criteria of ACR, 2010), over 18 years old, duration of RA at least 1 year, no active disease and no change in treatment in 6 months ago, and no physical symptom of therapy modification included in the study. The participants who did not perform serologic tests and sonography were excluded from the study. The sample size (n = 70) was estimated using sample size method for prevalence studies and taking into justification the 95% confidence level and the calculated fault rate of 0.05. The patient was examined by an expert rheumatologist. Demographic variables and laboratory tests such as rheumatic factor (RF), anti-cyclic citrullinated peptide (anti-CCP), ESR, and CRP were recorded in this study. A total of 28 joints in each patient contained bilateral shoulder, elbow, wrist (radiocarpal and mid-carpal joint), MCP, and PIP of the two hands examined by the rheumatologist. Ultrasonography was conducted for all patients with remitted RA (by clinical and laboratory examination) for 30 min by a radiologist who was unaware of clinical examination results, on the same day after clinical examination. Sonography was performed using an ATL HDI 3000 machine (ATL), with a 10-5 MHz linear array “hockey stick” transducer, according to the EULAR guidelines. Sonography assessments were based on B-mode or GS sonography and PD sonography. For each patient, 28 joints (in total 1960 joints) were examined with sonography. Synovitis and effusion were evaluated with GS and hyperemia with PD US. The SPSS 24 was used for statistical analysis (IBM corporation, USA). The data presented mean ± standard deviation or number (percent) where applicable. P < 0.05 was considered statistically significant. There were seventy patients (15 men and 55 women) with the diagnosis of remitted RA. The mean age of individuals was 53.3 ± 13.0 ranged 24.0–81.0 years old. Mean duration of disease was 10.6 ± 8.9 years, and 59 (84.3%) of them had RA for more than 2 years. From 70 studied patients, 92.9% (n = 65) of patients were received low dose of corticosteroid. The most common treatments were steroid with two disease-modifying antirheumatic drugs (DMARDs). 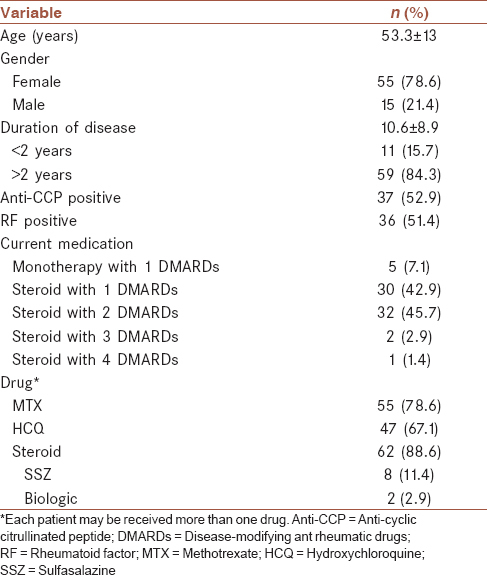 About 45.7% (n = 32) of patients got steroid with two DMARD [Table 1]. Methotrexate was the most drugs that were administrated. Laboratory findings demonstrated that ESR and CRP were normal for all patients, RF test was positive for 36 individuals (51.4%), and 37 patients (52.9%) showed anti-CCP-positive test. The mean of systolic blood pressure and diastolic blood pressure were 120.6 ± 24.1 and 73.1 ± 9.7 mmHg, respectively. Baseline characteristics of RA patients are shown in [Table 1]. Accordingly, among all 1960 evaluated joints, 3.2% (n = 63) of joints had positive sonography findings, which contain 1.2% (n = 24) of joints with synovitis, 30 joints (1.5%) with hyperemia, and 1.1% (n = 21) with effusion. From 63 sonography positive results, knee joints appeared to have the most problems including 37.5% (n = 9) with knee synovitis, 86.7% (n = 26) with knee hyperemia, and 76.2% (n = 16) with knee effusion [Table 2]. The prevalence of type of joint involvement in sonography assessment has been shown in [Figure 1]. Our results showed that sonography detected 44.3% subclinical arthritis which corresponded to 3.2% of all 1960 evaluated joints. In Bellis et al. study, the prevalence of GS synovitis was 71.6% and PD synovitis 42% which is in agreement with our study. Our finding confirmed by Ziswiler's study results which reported sonography is more sensitive than clinical examination. This Is a Descriptive Study on a Small Number of Joint Ra Patients Which May Lead to Imprecise Estimation of Sonography Findings. Furthermore, Lack of Comparison Group Pushed Us Just to Describe Findings. Our Cases Had a Long Duration of Ra from 2 to 19 Years. US can help to detection joint involvement in remitted RA patients. This study was supported by Isfahan University of Medical Sciences. This design was registered in Research Faculty of Medical School of Isfahan by code 395112. Firestein GS, Budd RC. Kelley's Text Book of Rheumatology. 10th ed. Philadelphia: Elsevier Sounders Publication; 2017. p. 1165-84. Karimzadeh H, Seyedbonakdar Z, Mousavi M, Karami M. Comparison the percentage of detection of periarthritis in patients with rheumatoid arthritis using clinical examination or ultrasound methods. J Res Med Sci 2016;21:134. Jamshidi AR, Tehrani Banihashemi A, Roknsharifi S, Akhlaghi M, Salimzadeh A, Davatchi F, et al. Estimating the prevalence and disease characteristics of rheumatoid arthritis in Tehran: A WHO -ILAR COPCORD study (from Iran COPCORD study, Urban study stage 1). Med J Islam Repub Iran 2014;28:93. Scirè CA, Montecucco C, Codullo V, Epis O, Todoerti M, Caporali R, et al. Ultrasonographic evaluation of joint involvement in early rheumatoid arthritis in clinical remission: Power Doppler signal predicts short-term relapse. Rheumatology (Oxford) 2009;48:1092-7. Felson DT, Smolen JS, Wells G, Zhang B, van Tuyl LH, Funovits J, et al. American College of Rheumatology/European League against Rheumatism provisional definition of remission in rheumatoid arthritis for clinical trials. Ann Rheum Dis 2011;70:404-13. Saleem B, Brown AK, Keen H, Nizam S, Freeston J, Wakefield R, et al. Should imaging be a component of rheumatoid arthritis remission criteria? A comparison between traditional and modified composite remission scores and imaging assessments. Ann Rheum Dis 2011;70:792-8. Ben Abdelghani K, Miladi S, Souabni L, Kassab S, Chekili S, Laatar A, et al. Role of ultrasound in assessing remission in rheumatoid arthritis. Diagn Interv Imaging 2015;96:3-10. Ozgocmen S, Ozdemir H, Kiris A, Bozgeyik Z, Ardicoglu O. Clinical evaluation and power Doppler sonography in rheumatoid arthritis: Evidence for ongoing synovial inflammation in clinical remission. South Med J 2008;101:240-5. Brown AK, Quinn MA, Karim Z, Conaghan PG, Peterfy CG, Hensor E, et al. Presence of significant synovitis in rheumatoid arthritis patients with disease-modifying antirheumatic drug-induced clinical remission: Evidence from an imaging study may explain structural progression. Arthritis Rheum 2006;54:3761-73. Bhasin S, Cheung PP. The role of power doppler ultrasonography as disease activity marker in rheumatoid arthritis. Dis Markers 2015;2015:325909. Martinoli C, Pretolesi F, Crespi G, Bianchi S, Gandolfo N, Valle M, et al. Power Doppler sonography: Clinical applications. Eur J Radiol 1998;27 Suppl 2:S133-40. Kawashiri SY, Suzuki T, Nakashima Y, Horai Y, Okada A, Iwamoto N, et al. Ultrasonographic examination of rheumatoid arthritis patients who are free of physical synovitis: Power doppler subclinical synovitis is associated with bone erosion. Rheumatology (Oxford) 2014;53:562-9. Micu MC, Fodor D. Concepts in monitoring the treatment in rheumatoid arthritis- the role of musculoskeletal ultrasound. Part I: Synovitis. Med Ultrason 2015;17:367-76. Filippucci E, Iagnocco A, Meenagh G, Riente L, Delle Sedie A, Bombardieri S, et al. Ultrasound imaging for the rheumatologist VII. Ultrasound imaging in rheumatoid arthritis. Clin Exp Rheumatol 2007;25:5-10. Bellis E, Scirè CA, Carrara G, Adinolfi A, Batticciotto A, Bortoluzzi A, et al. Ultrasound-detected tenosynovitis independently associates with patient-reported flare in patients with rheumatoid arthritis in clinical remission: Results from the observational study STARTER of the Italian Society for Rheumatology. Rheumatology (Oxford) 2016;55:1826-36. Ziswiler HR, Tamborrini G. Musculoskeletal Ultrasound II-(Why are Bats Better than Physicians). Praxis; 2001. Brown AK, Conaghan PG, Karim Z, Quinn MA, Ikeda K, Peterfy CG, et al. An explanation for the apparent dissociation between clinical remission and continued structural deterioration in rheumatoid arthritis. Arthritis Rheum 2008;58:2958-67. Funck-Brentano T, Etchepare F, Joulin SJ, Gandjbakch F, Pensec VD, Cyteval C, et al. Benefits of ultrasonography in the management of early arthritis: A cross-sectional study of baseline data from the ESPOIR cohort. Rheumatology (Oxford) 2009;48:1515-9.